Historic photos, personal stories and anecdotes helped bring the treasures of the Richmond County Museum alive for Triad members at the April 28 meeting, when Richmond County Museum Board President Becky Marks and Board member Roger Hale (Design Printing) spoke to the group. The Museum, founded in 1992 as part of the Tricentennial, is housed in the old 1872 jail building in Warsaw. Upstairs, Sheriff Bryant pointed out, is the old “hanging closet,” and Becky noted that some children—and even some adults—refuse to go up the 13 steps to the chamber. The museum’s mission is to preserve and interpret county history, and it collects memorabilia and artifacts from Richmond County. Permanent exhibits include the Rappahannock Indians; Francis Lightfoot Lee, signer of the Declaration of Independence; William Atkinson Jones, author of the bill to grant independence to the Philippines; Moore Fauntleroy, founder of Rappahannock County, out of which was carved Richmond County and Westmoreland County; and a country store. Becky said she can schedule group tours or special openings of the museum. It also participates in the Museums on the Go project, which takes museum information out to schools, as well as holding events for home-schooled students. They will also go out to speak to other groups. No admission is charged at the museum, which is run by volunteers, plus a part-time curator shared with Essex County Museum. Hours are Wednesday through Saturday, 11 a.m. to 3 p.m., from February through mid-December. Becky said they are always looking for volunteers to train as docents, especially to serve on Saturdays. Volunteers could also help the curator catalog exhibit items. Fundraisers include the Tree of Love illumination at Christmas time; and an historic homes tour. Roger described the building and encouraged people to visit. Through April there’s a special exhibit on Black History; it will be followed by an exhibit on the Lemoine-Griffith house in Emmerton, the next historic homes tour (Sept. 19, 2-5 pm). “Believe it or not, the 20th century is history now,” said Becky. Noting that the museum is happy to take donations of artifacts, she said they now have two stills. She’s about to donate a metal box (stamped with “Sharps, Virginia”) used for shipping eggs through the postal service. 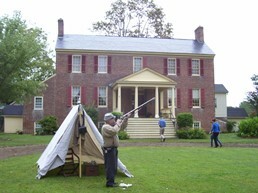 Roger related some of his experiences as a Civil War re-enactor: “I live in a tent, drink out of a tin cup, cook on the fire, and do everything just like they did.” At Appomattox, he was part of a reenactment of the end of the Civil War. On Friday, they were fed by the Union soldiers: seven pieces of hard tack, two potatoes, a pinch of brown sugar, some coffee grinds. They got their parole papers, and on Sunday lined up to surrender their arms. “I just love history,” he said, and his family has been on the Northern Neck since the 1600s. He’s always learning more about his ancestors. Becky added that the museum does have some genealogical resources.